Luxury motor yacht My Way has everything for your next charter vacation. 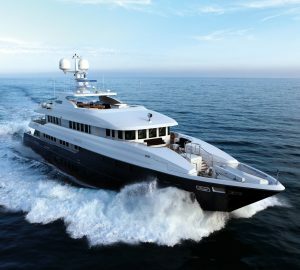 Custom-built in 1994 by Admiral, My Way is a magnificent 29m/95ft motor yacht. She also had a complete refit in 2009. From the moment you step on board you will be made to feel welcome by the captain and crew. 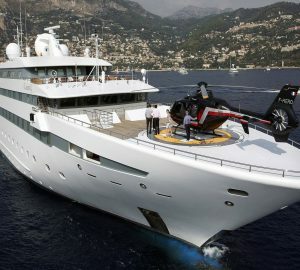 They all have many years of experience in and around the yachting grounds of the Mediterranean. 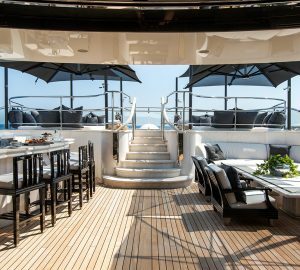 With an impressive maximum speed of 32 knots and a cruising speed of 23 knots, sit back on My Way’s foredeck that has relaxing sun pads and seating areas. As part of the yacht’s charter itinerary ask the captain to drop anchor in the owner’s private bay with its own secluded beach. It’s a wonderful spot, perfect for swimming and cooling off. 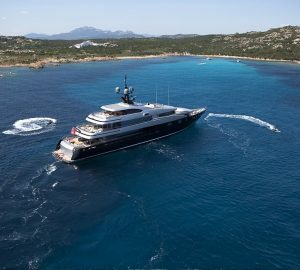 Enjoy breath-taking views of the Greek Seas and Turkish coastline on this superyacht, available for charter for up to 200 days a year. Experience gourmet dining al fresco style with a selection of breads, cheeses, meats and a glass of wine or two. The outdoor deck space is well designed, comfortable and practical. 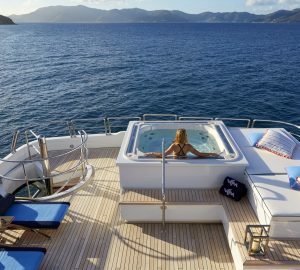 She might not have modern amenities like other yachts such as a Jacuzzi, open-air bar or hammocks, however the uncluttered deck is a place for sheer relaxation. You won’t fail to be impressed by the stylish and comfortable interior. The main saloon is spacious and bright with wraparound windows for splendid panoramic views. This allows plenty of natural light to flood in making guests feel relaxed in the most beautiful surroundings. 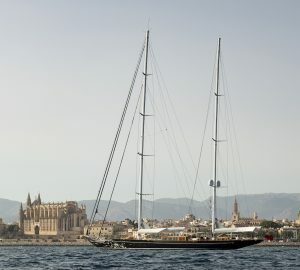 The superyacht My Way certainly has a classic style and elegance about it. The cream carpets and seating contrast well with dark glossy wood which has been used throughout the interior. Sofas are available in every room providing plenty of seating for guests. Timeless styling and eye-catching furnishings create an elegant as well as pleasant atmosphere. The main deck is where you can dine in formal surroundings. The dining area is spacious and light with seating for guests around a classic oval table. Friendly crew serve mouth-watering food without disturbing guests. Having a combination of soft lighting and classic décor makes this area most suitable for all occasions. What a spot to enjoy delicious al fresco meals or relax under the parasols having a catnap. Let’s move on to the main aft deck. 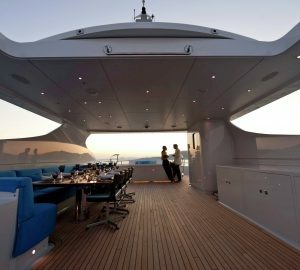 This deck has a covered outside dining area and unlike many similar yachts, the table is located to the side rather than in the centre of the deck. This is purposely designed to offer easy access to the interior and the swim platform. A ladder from the side of the aft deck allows for quick access to the warm, clear waters below. Her foredeck features a wonderful spot with sun mattresses. Here is another great area for nibbles, snacks and drinks, enjoy the unbeatable views too. My Way has four state rooms that are situated on the lower deck. These comprise of a master, two twins and a VIP cabin, a great layout especially for family vacations. The excellent interior layout sleeps up to eight guests in four rooms. Comfort and sophistication are what you can expect when staying in the large main state room. The good-sized wardrobes provide plenty of storage for all of your outfits. There’s even a small office area in the corner of the room, just what’s needed to keep in touch with family, friends or colleagues from the office. The en suite bathroom is simply a delight with its marble fitted sink, large well-lit mirror and shower. One of the many benefits of having four cabins in a superyacht like My Way is that there’s more space available. This means that each cabin has its own private bathroom and shower. The twin cabins also feature lots of storage space, en suite bathrooms and are situated adjacent to one another. Just like the master state room, the VIP cabin is awesome. Generous in size, the cherry wood furnishings provide charm, warmth and a feeling of luxury. What’s more large mirrors are featured in each of the state rooms emphasising the feeling of space and embracing natural light. For your relaxation and entertainment My Way has numerous facilities. On the port side of the saloon directly across from the seating area is a rosewood bar as well as a row of low-cut rosewood cabinets which house electronic equipment. Let your hair down and have a party dancing to your favourite music. 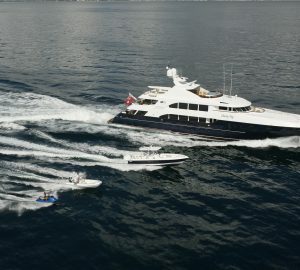 My Way’s impressive entertainment and leisure facilities make her the perfect charter yacht for socialising and entertaining family or friends. If you’re feeling energetic there are jet skis, water skis, fishing equipment, scuba diving and snorkelling gear. There’s also a large tender for towing inflatable toys. When planning a yacht charter vacation, it’s a good idea to choose an experienced crew. My Way can carry up to five crew on board to ensure a relaxed, yacht holiday experience. They will make sure that you enjoy the very best of what the best yachting locations have to offer. What could be better than eating freshly caught seafood then cooked for you by the on-board chef? To satisfy your taste buds even more, the chef will use locally sourced ingredients to make your meals even more tasty. Enthusiastic crew will ensure you have everything you need throughout the voyage. They will be able to anticipate what you require at any time so you virtually don’t have to ask for anything. After your first meal of the day the captain will head out to sea. Take this opportunity to see beautiful rugged coastlines, villages in the hills, quaint churches and many small islands which make up the Mediterranean.